Veterinarians and dentists recommend that you brush your dog’s teeth as often as possible! Some say once a day, some say two to three times a week. Brushing as frequently as possible is the most effective way of preventing tooth decay and helping to preserve oral health, particularly if you have a dog prone to bad teeth. 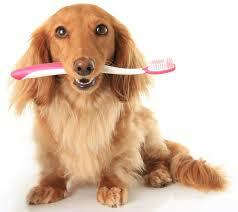 For dogs, the most important factor in brushing is the abrasiveness of the tooth-brush. You don’t want a brush so rigid that they’ll hurt your dog’s gums so choose bristles that are soft and will fit in your dog’s mouth appropriately. This mechanical scrubbing helps remove the plaque which builds up constantly. What you are trying to prevent by brushing is the build up of plaque before it mineralizes and hardens into tartar (or calculus). Tartar can only be removed with dental cleanings under general anesthesia, so ideally, you want to prevent tartar build up instead of putting your dog under anesthesia. Another option is to use a 4X4 piece of gauze wrapped around your finger to gently scrub away at the plaque. Surprisingly, some dogs will tolerate this quite well. This may be a good “starter” method before you try to use a tooth-brush in your pets mouth.